Since starting wwiiafterwwii, I have wanted to do something on this topic but was unsure how to approach it. I am interested in how WWII weapons performed in battle against Cold War replacements. But also, it is fascinating to consider how they ended up where they did after WWII……how did a Garand built to fight Imperial Japan end up in the Somali desert in the 1970s, or how did a Waffen-SS sturmgewehr end up in 21st century Damascus? Force Publique was the local military force of the Belgian Congo, when it was still a colony of Belgium. It was a fairly unusual military force, not surprising as the Belgian Congo colony was itself unusual. The Belgian Congo was massively larger than Belgium itself. It existed solely for economic exploitation; the Belgians having no real strategic military interest in it and having no desire to develop it. African people in the Belgian Congo were of course completely shut out of Belgium’s political process. Until the late 1950s, they could not even hold local elections in their own small villages. The colony was directly ruled from Brussels. 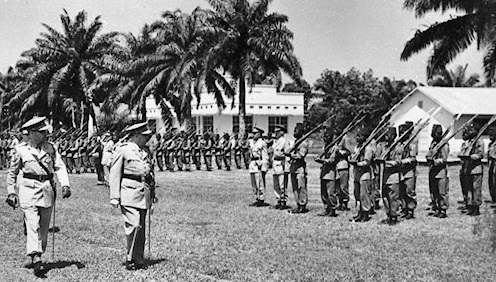 Whereas most European powers began granting independence to African colonies in the late 1940s/early 1950s, Belgium had no intention of giving up the Congo and, like Portugal, foresaw it’s colonialist empire as permanent. Force Publique was formed in 1908. The objective was to obtain security for the colony at a minimal cost to Belgium. The officers were all Europeans. Africans were prohibited from being promoted above junior enlisted NCO, and most were never advanced in rank at all. Little to no formal tactical training was given to the Africans, and quite frankly, they were basically regarded as inexpensive, replaceable cannon fodder to guard Belgian economic interests in the colony.